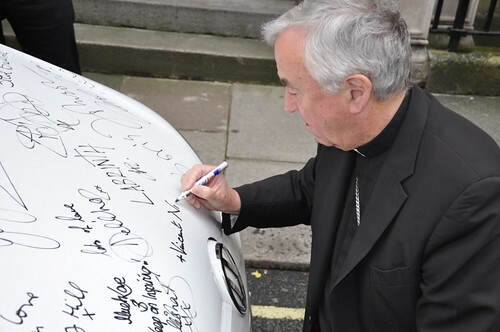 The Most Rev Vincent Nichols, Archbishop of Westminster, signed the ‘Peace Car’ on Wednesday 17 October, as part of a campaign to encourage young people to foster peace in their communities. 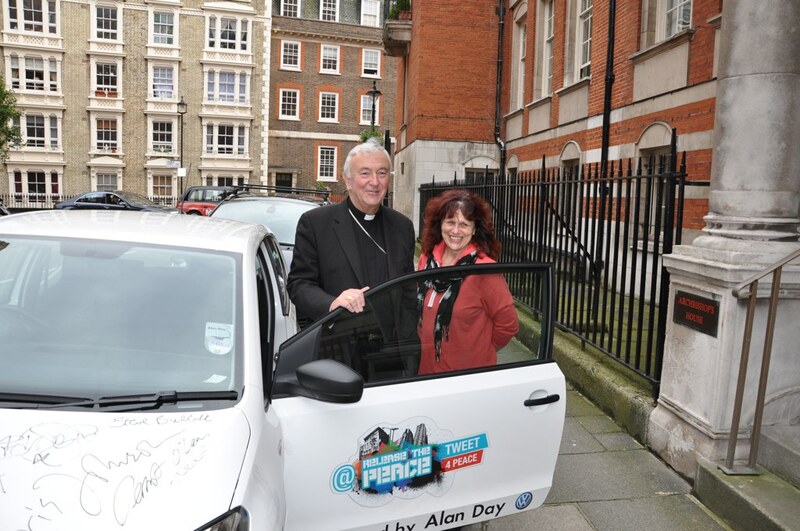 The Peace Car was presented by Barry and Margaret Mizen, on behalf of the Jimmy Mizen Foundation, a charity of which Archbishop Nichols himself is patron of. The Peace Car is part of a joint initiative between The Jimmy Mizen and The David Idowu Foundations called Release the Peace. Both foundations were formed by families as a consequence of the tragic loss of their sons to violent attacks by other young people. The aim of the initiative is to encourage young people to use their energy productively in their community to encourage peace and dialogue between different groups in society. It also seeks to reward these positive acts by providing tickets to sporting and musical events. The Peace Car offers a way to bring Release the Peace to schools and young people and encourage them to engage proactively with its message. Barry Mizen, father of Jimmy Mizen, spoke about the meaning which the Archbishop’s signing has for them as Catholics, “Our faith is what has guided and supported us since the murder of our son, we were determined not to be beaten by our Jimmy's loss and something good must come from it... we thank the Archbishop, who is also our patron, for signing the car. For us it is the most important signature, and so appropriate as we visit many Catholic Schools". 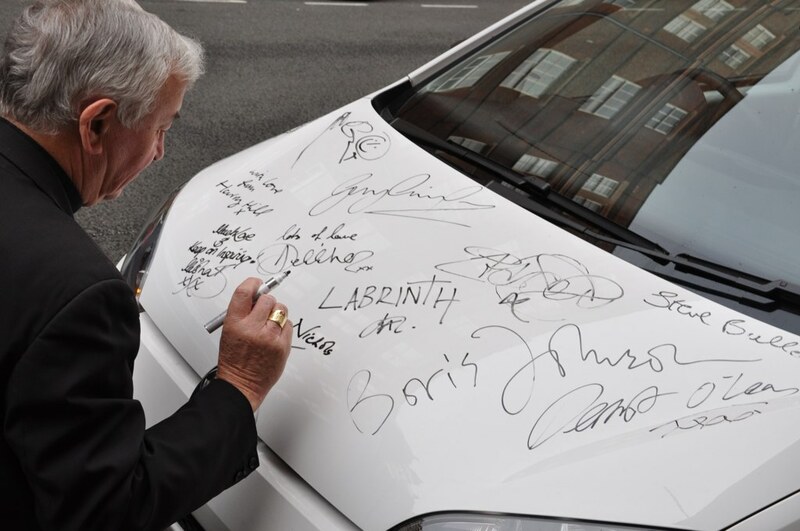 The Peace Car has been signed by a number of other public figures and celebrities who endorse the campaign including Boris Johnson, Dermot O’Leary and Gary Lineker. Moreover, in the upcoming week, Archbishop Desmond Tutu is also due to sign the Peace Car. 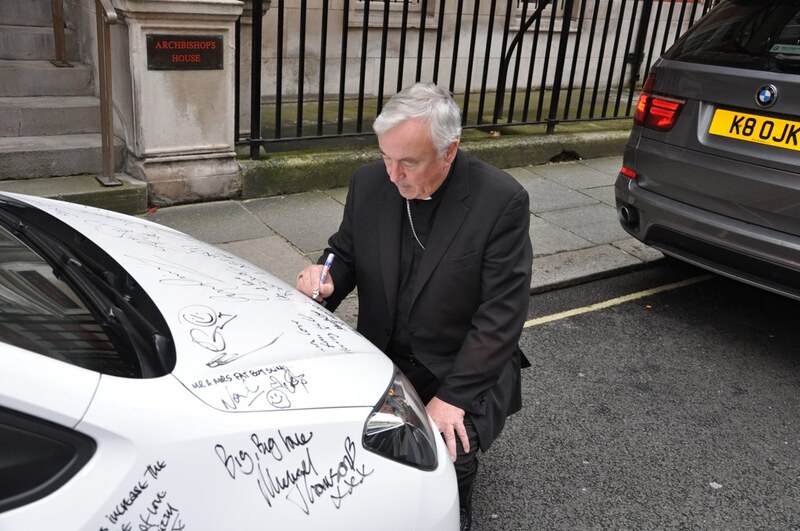 For further photos of Archbishop Nichols' signing visit our Flickr site.